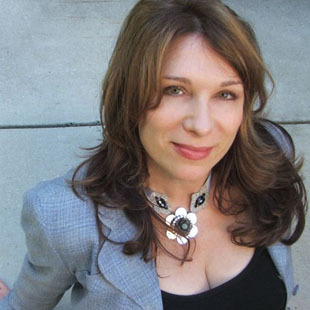 Lindy Robbins has been a successful pop songwriter for the past 10 years, but this year she has emerged as one of the hottest, co-writing three Top 10 hits on the Billboard Hot 100 chart: “Tonight Tonight” for Hot Chelle Rae, “Skyscraper” for Demi Lovato, and “It Girl” for Jason Derulo. Based in Los Angeles, Robbins is known as one of the best “topline writers,” contributing melodies & lyrics to songs in collaboration with top writers/producers. Robbins has become an in-demand writer who co-writes with not only top producers and other topliners, but many established and rising artists.She prolifically writes 125-150 songs per year which are either recorded as cuts or demos. She is based in Los Angeles, but she often travels to New York, London or Nashville, or wherever it’s necessary to work on hit projects. In addition to her three recent Top 10 hits, Robbins has had additional singles with Selena Gomez (“A Year Without Rain”), Hot Chelle Rae (feat. New Boyz) (“I Like It Like That”), Javier Colon (“Stitch By Stitch”), Demi Lovato (‘Here We Go Again’, ‘Breathe Carolina (“Hit and Run”), Big Time Rush (“If I Ruled The World”), Lemonade Mouth (“Somebody”) and Days Difference (“Down On Me”). She’s also had cuts with One Direction, David Cook, Lee DeWyze, Jason Mraz, Leona Lewis, Brandy, Jesse McCartney, David Archuleta, Jordin Sparks, Kris Allen, Westlife, Monica, Shaggy, Clay Aiken, Katharine McPhee, Faith Hill and Anastacia. Prior to her recent success, Robbins was known for co-writing the hits “Incomplete” for the Backstreet Boys, “What’s Left Of Me” for Nick Lachey, and “Cinderella” for the Cheetah Girls. We are pleased to present this Q&A interview with Lindy Robbins. She tells how she got started in the music business, she discusses her early cuts and publishing deals, and her gradual progression to her current hit activity. In this article, Robbins gives a good overview of what it takes for a topline writer to be succesful. Robbins: It was in 1997 that I decided to concentrate on being a fulltime songwriter. I’m originally from Los Angeles, but I had been living in New York City for six years. I was a performer in a vocal group, and I was writing art songs, cabaret songs and songs for the group. But I’ve always really wanted to write pop songs. So I decided to move back to Los Angeles and get into the music business there. At the time I had no money, lived in a small apartment, and had no writing partners yet. I saw an ad for the Music Bridges (Unisong) international song contest hosted by Allan Roy Scott. I entered one song and it won the entire contest! The grand prize was a trip to Dublin, Ireland for a songwriting retreat which included writing with hit songwriters. I was able to do well at this retreat, which led to getting my first music publishing deal with Polygram Music. Roanna Gillespie signed me to Polygram. Pictured (l-r): Eman, Evan Bogart & Lindy Robbins. DK: How did it go with Polygram Music? Robbins: It went slowly at first, but I was pleased that (respected songwriter) Marsha Malamet co-wrote a few songs with me, and Roanna was setting me up with some up and coming producers which led to some holds and got me noticed. Eventually, my first big cut was “Cinderella” for the Cheetah Girls–it became a #1 song on Radio Disney. I also got cuts with Faith Hill, Anastacia, Monica and Clay Aiken. My first, big hit single was co-writing “Incomplete” for the Backstreet Boys (in 2005). I originally pitched it to an A&R person at Jive Records who passed on the song. But I had a strong feeling about it, so when (A&R exec) Teresa LaBarbera Whites joined Jive Records, I asked Donna Caseine who was now my publisher at Universal to pitch it to her. She loved the song and placed it with the Backstreet Boys and it became their first single. Teresa also arranged the co-write with Nick Lachey , and I brought Emanuel Kiriakou who I had just started working with and longtime collaborator Jess Cates and we wrote “What’s Left Of Me” on her artist Nick Lachey, which became his first single and a hit. DK: Did having these hits lead to co-writing more with top producers and artists? Robbins: Having singles was definitely a big game-changer. It raised my cachet and made me more in-demand. I did get a lot of cuts in the next few years (2007-2011), with Jordin Sparks, Demi Lovato, several artists from American Idol and others. But these cuts didn’t become big singles. DK: Did you stay with Polygram Music for a long period? Robbins: Yes. Polygram Music merged with Universal Music Publishing, and I worked for many years with the terrific (creative exec) Donna Caseine there. I stayed at Universal until 2008, when I left to sign an administration deal with Kobalt Music. DK: Who are the main writer/producers that you collaborate with? Robbins: I work with several, amazing writer/producers, and my longtime regulars areToby Gad, Emanuel (Eman) Kiriakou and Evan Bogart. 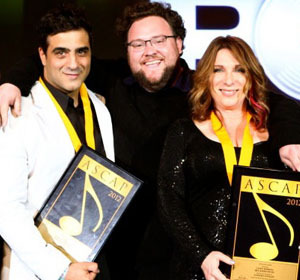 I met Toby at the ASCAP Pop Awards a few years ago, and I really pursued working with him. I kept emailing him, and said I’d love to work with him. At the time Toby was based in New York, and I would fly to New York to work with him. Now he’s based in L.A. and we work a lot together. We wrote “Skyscraper” (for Demi Lovato) and “A Year Without Rain” (for Selena Gomez) ‘Taken’ and ‘Truly Madly Deeply’ for One Direction and have had many cuts together. Toby began requesting (to labels) that I co-write with the artists, so that was big step to getting more cuts. I’ve also worked for many years with Eman. We co-wrote with Evan Bogart the hits “Tonight Tonight” (with Hot Chelle Rae) and “It Girl” (with Jason Derulo) and songs for upcoming MKTO on Columbia. I also write with other writers and producers all over the world including Wayne Hector, Steve Robson, Steve Mac, Sandy Vee, Chris Braide, Chris DeStefano, Fraser T. Smith, David Hodges, Dave Bassett, and Jeff Cates. 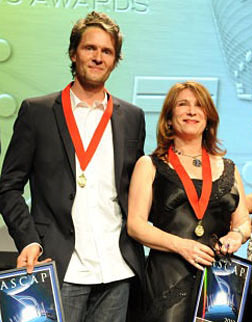 Lindy Robbins with Toby Gad. DK: How do you usually like to write? Do you come up with ideas before the writing session? Robbins: I always bring in some title ideas. But the preferred way I like to write, is to be inspired by music. I always love a three-way co-write. The third writer would be the artist, or a writer who’s a great singer who would sing the demo. I usually like it when the producer starts playing something, or someone starts playing a guitar or piano or track idea and we see what it inspires. Toby likes to start with titles. We talk to the artist, and we ask them what’s going on in their lives, so we can write a song together that is personal to the artist . I like writing in a room with people–that’s how I write 90% of the time. I like getting the feedback and hearing what they say. If there are three great writers in the room, the chances of writing a great song are better. DK: You are known as a “topline writer.” When did this phrase become common, and do you like this phrase? Robbins: The word “topliner” was used first in the U.K. music business. It’s been about seven years I believe since topliner referred to people who can write melody and lyrics in the US. I love being called a topliner. I used to just be known a lyricist only because there wasn’t a word to describe what I and other topliners do, but now people know I write melodies just as well as lyrics. DK: How did you co-write “Tonight Tonight” for Hot Chelle Rae? Robbins: We wrote “Tonight Tonight” in 2010 and it came out in 2011. I wrote it with Eman and Evan Bogart–we have a great chemistry and it was fun writing this song. Then the label liked it and presented the song to Hot Chelle Rae and they liked it too. Two of the guys–Ryan Follese and Nash Overstreet–made some changes to make it better suit the group and contributed to writing the song. I also wrote “It Girl” with Eman and Evan. This song just poured out of us one day. We sent it to Jeff Fenster (A&R exec at Warner Bros. Records) and he liked it, so he played it for Jason Derulo. Jason also contributed to the writing–he came in and really put his stamp on this song. DK: How did you write “Skyscraper” for Demi Lovato? Robbins: It was actually written four years earlier–Toby Gad and I wrote it with Kerli (Island Def Jam artist) for her record but then she left the label. 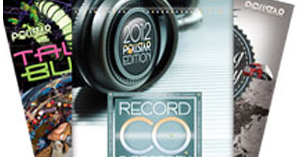 Later it was also recorded by Jordin Sparks but didn’t fit her record. Then it sat on the shelf for a few years, but as it turned out, it fit perfectly for Demi Lovato. It’s as if the song had been written for her and was always waiting for her to record it. The wonderful Benjamin Groff at Kobalt Music played it for Jon Lind (A&R exec at Hollywood Records). Jon then became a huge believer in this song–he recommended that “Skyscraper” become the first single for Demi’s album, even though it was a slower song. Jon, Jeff Fenster and Teresa LaBarbara Whites have meant the world to me and my career, always believing and talking chances on my songs. DK: Do you like to write in several genres of music? Robbins: I used to be known for just writing pop/rock ballads. But because I’ve recently written some quirky pop hits, I’m now known for being more versatile and for writing a wider range of styles. I like to write in every genre of pop and I also like writing country songs, and I go to Nashville to collaborate. It fun to keep changing things up. DK: Besides working with your co-writers, do you have a manager or a business team? Robbins: Yes. I’m managed by Andy Kipnis at AAM (Advanced Alternative Media). I also work with Beka Tischker at AAM who is the person I touch base with daily, and Chris Woo of AAM for the U.K. I like having a management team on my side who can help guide me. They’ve played a big part in networking and getting me in the door. DK: Lastly, what advice would you give to young, topline songwriters who are trying to break into business? Robbins: It’s important to be aggressive and persevere, because I believe that the cream always rises to the top. The ones that are good–they find a way. If your songs are great, people will hear it and people will want it. Word gets around, and there aren’t that many great people out there. The producers that you work with are important–the demo needs to sound amazing. There are no rules. The big producers often sign young writers to work with. You could sign with a production team instead of with a publishing company.